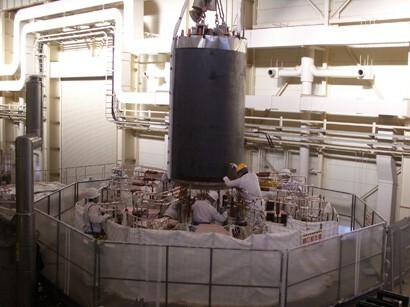 PF Insert Coil being installed into the bore of the CS Model Coil in the test facility at Naka, JAEA. A test coil wound with a prototype superconductor for the ITER Poloidal Field (PF) coil was installed on 24 January 2008 in the test facility at the Naka Fusion Institute of the Japan Atomic Energy Agency (JAEA). The test coil, named "PF Insert Coil", has been wound by Europe using a superconductor supplied by Russia. It was transported from the UK, where the coil winding was performed, to Naka for testing last year. The PF Insert Coil has an outer diameter of 1.6 m, a height of 3.4 m and a weight of 6 tons. The test facility at Naka has unique features, including the CS Model Coil, which can provide test conditions similar to those in the ITER operation in terms of a large current in both DC and pulse and a high magnetic field in a large volume. The installation was performed by JAEA with a witness from the European Fusion Development Agreement (EFDA). As a next step, connections of cryogenic pipes, electric bus-bars and instrumentations will be performed. The PF Insert Coil will then be cooled to 4 K (-269ºC) in May using a 5 kW refrigerator. A series of tests are planned for about two months, including charges to a maximum current of 52 kA and a maximum magnetic field of 7 T to explore operational limits, while a nominal operating condition of the ITER PF coil is 45 kA and 6 T. These tests will be performed jointly by the ITER Organization, EU and JA, and their results will be used to finalize the design parameters of the PF conductor and to start its procurement. The successful installation of the PF Insert Coil, therefore, represents an important step in the qualification of the PF conductor performance.